Main benefit: Easy literature access to all participating researchers. Severeal of the Mozambican researchers that got involved in project activities early on had poor access to literature on Jatropha and it was therefore decided to make a collection of electronic documents. It was put on a web site and copied to CDs. Regular updates took place. To comply with copyrights the access to the website was restricted to participating researchers only. 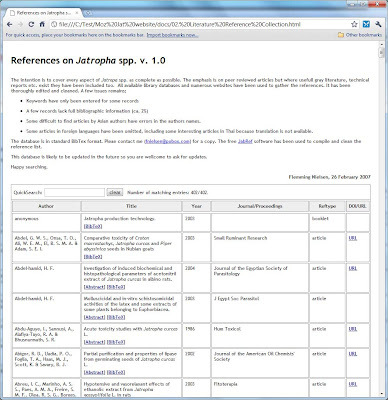 The free JabRef software has been used to compile and clean the reference list. JabRef has nice facilities for generating html pages and provide easy access in standard BibTex format. From 2007 the access to scientific literature improved for the IIAM based researchers and the special collection was not warranted. In 2008 the website was consequently taken down. To the right is an example of the html interface.